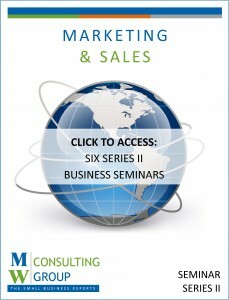 The MWCG Seminar Series will provide you with sound business strategies and tools to promote your business, increase sales and ensure financial solvency. These 22 unique seminars and workbooks do not appear or exist with other consulting firms, motivational speakers or business coaches. We share the best practices and applications in marketing, social media, sales and operations from the top small businesses across the U.S. and Canada. These examples are shared in group seminars and answer the question, “What are other business owners doing?”. Attend one of our seminars and you will see and experience the difference that over 20,000 seminar attendees have felt. Are you looking for ways to provide added value for your business, owners, partners, successors, children, owner relatives, mangers, key staff members, associates considered for promotion, future leaders and managers, member groups, cooperatives, franchisors, franchisees and association board members? they can’t get it wrong”.